There was a couple coming toward us on the sidewalk holding hands. They were dressed stylishly but casually, she in short suede fawn ankle books, skinny jeans and a tunic-like jacket and he in khaki prep. He looked to be in his early 30s. Savannah hadn’t been on our original itinerary but Mr. History Tourist had never been so we decided to make a one-night stop over on our way back north. I’d been before and had seen all the museums, so we made this a Grant-centric visit and did what he wanted to do, which was wander the streets and just get a feel for the town. We started at the visitor center, which has a huge parking lot and is a good place to leave the car for the day. It’s at the edge of the downtown tourist area, so it was also a good place to start our wander. 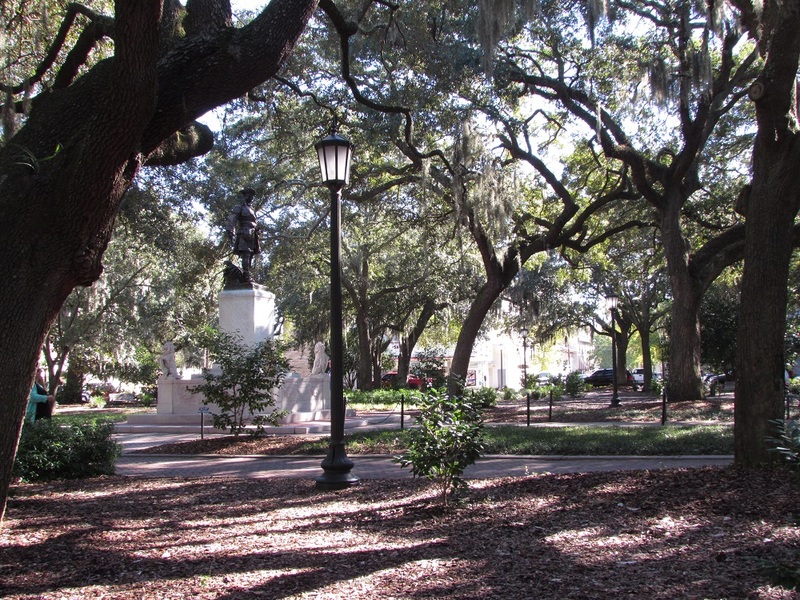 Savannah is known for its squares — 22 in all — and one way Savannah messes with tourists is: there’s usually a statue in the middle of the square and the statue is never of the person for whom the square is named. Look! Here’s a statue of Revolutionary War hero Nathanael Greene, we’d say, so we must be at Greene Square. No, we were in Johnson square, where Greene’s statue is located and where Greene is buried (under his statue). There is a Greene Square, although I don’t remember (and couldn’t find any reference to) a statue there. Johnson Square was named after Robert Johnson, a colonial governor of South Carolina and friend of James Oglethorpe, Georgia’s founder. I don’t know if Johnson has a statue in someone else’s square, but Oglethorpe has a statue in Chippewa Square. There is an Oglethorpe Square, named for him, but that has a statue of Moravian missionaries in the middle of it. Whiskey Tango Foxtrot. Along the route that took us from square-to-square, in mid-town, was Colonial Cemetery. I’m posting the photo of the grave above just so that I can mention the name Button Gwinnett, who is buried there. Button Gwinnett was a representative of Georgia to the Continental Congress. Button Gwinnett was a signer of the Declaration of Independence. Button Gwinnett. The last time I was there, there were people dressed as (what looked like to me) gothic angels posed all over the cemetery. We guessed that they were Savannah School of Art and Design students doing a class project. The school is in the middle of town too. I suppose the horse-headed woman could have been part of an art school project as well, although the guy seemed a little old for school. 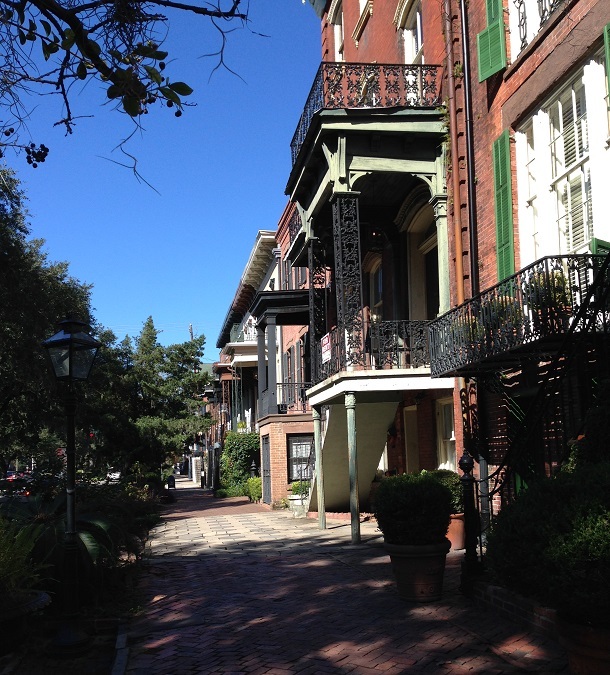 The art school has a lot to do with the feel of Savannah. It’s got its history and requisite quirky southern charm, but it’s also got an affected, unpolished, in-your-face, over-the-top artsy-ness to it, that I associate with the enthusiasm of novices and recent converts. Twenty-two squares later, we stopped for lunch at a place called The District Cafe. The food was good and what I’d describe as basic American (organic, farm-to-table soups, salads and sandwiches). But the best part of our lunch experience was our waiter. He dripped ennui. He was so clearly not into his job and so dramatic in conveying that feeling that we decided that it was performance art. Each encounter was punctuated with a sigh and he moved as if under water. Fortunately, there was another man — a host or manager, perhaps — who filled in the gaps so we ended up having better than average service. Up next: I get around to the history part of Savannah. 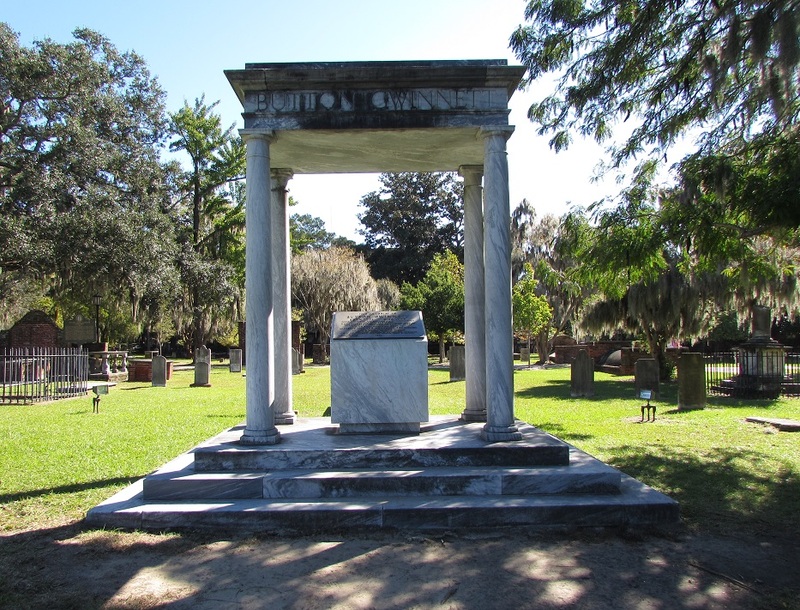 Gallery | This entry was posted in Georgia and tagged Button Bwinnett, Colonial Cemetery Savannah. Bookmark the permalink. Gotta love the name, and now I have to look up Button Gwinnett. Only explanation I can think of for that name is the liberal use of alcohol in the 18th century. Either Mom was dosed up during delivery, or Dad was celebrating the arrival of a son!